A whirlwind week has shot me from Dallas to Phoenix, which graced me with awesome live shows from Tesla, Def Leppard, Styx, and the Foo Fighters. A six a.m. flight from Phoenix landed me in Denver for an unplanned Oktoberfest with my fellow photographer and model, Katy Mor, followed by a brief journey to my beer Mecca, Breckenridge. 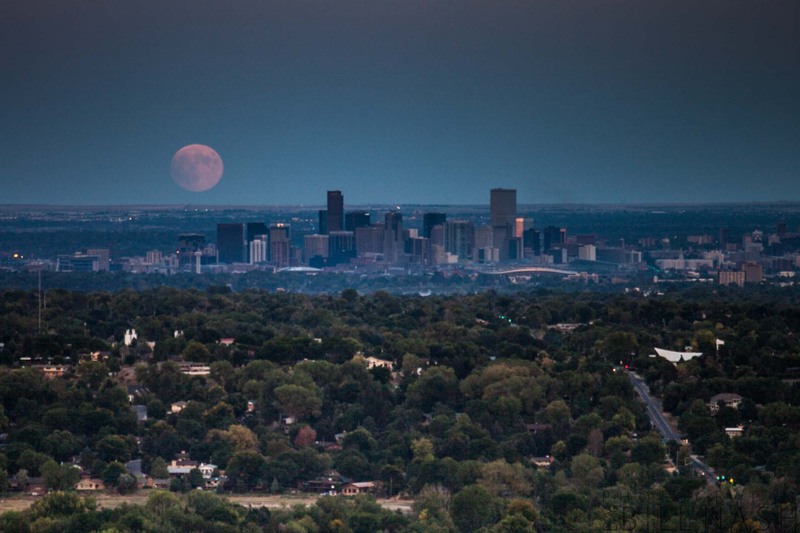 In the heavy traffic coming down the mountain entering the west side of Denver, I’m flipping around the map app in my phone, looking for some place with a good elevation to view the moonrise, looking east into downtown Denver. The first thing I find is the Table Top Mesa, on the edge of Golden. After one wrong turn and a brief hike, we found ourselves with a clear, unobstructed view of downtown Denver. Thankfully, I had a model with me. The moonrise was certainly a sight to behold, but we got robbed on the lunar eclipse due to high clouds. Tomorrow, it’s back to Dallas, to finish packing for a few months in New York! Previous Previous post: The stars at night are big and bright, deep in the heart of Texas. Next Next post: New York, New York.